Label Rouge traditional Christmas turkey is highly valued for its tender, unctuous flesh that is obtained only by using exceptionally long, traditional outdoor breeding methods. When roasted and stuffed, a traditional turkey serves 8 guests. Hardy breeds, with black or bronze feathers, selected for the quality of their meat and their slow growth. Turkeys are reared in little flocks in small, well-lit poultryhouses in natural daylight (400 to 500 m² maximum). 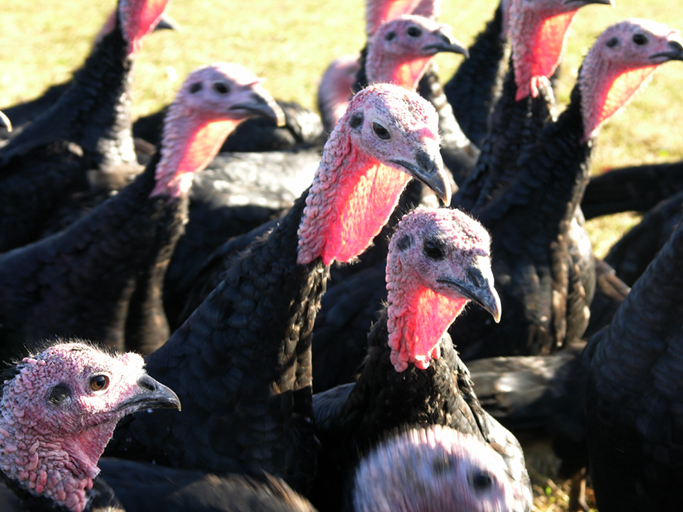 They are allowed to roam free in the open air on grassy and/or shaded areas (6 m² minimum per turkey). Label Rouge traditional turkeys are not slaughtered until they reach the age of at least 140 days, i.e., twice as old as a standard turkey. Label Rouge traditional turkeys are class A fowl (European standard pertaining to external appearance) and they must therefore be perfect in terms of their presentation. They can be presented partially eviscerated (with giblets) or ready-to-cook. Their mean weight as ready-to-cook fowl ranges from 2.5 to 35 kg. Their shelf life is 15 days maximum after slaughter.